Thinking is the highest function you are capable of. This book will help you improve every aspect of your life. Buy two and give one to a friend. 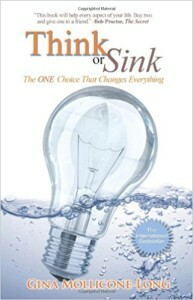 The ideas and techniques in Think or Sink are a very big part of who I am. I have personally used the techniques to create incredible success and magic in my own life. I know that it can make a massive difference in your life too. I promise this from the bottom of my heart. Enjoy! Would you like to make 2010 your greatest year ever? Pursue your dream? Make more money? Lose some weight? Have you had some challenging and stressful circumstances recently? Job changes? Health concerns? Would you like to learn how to be happy regardless of what is going on in your life? Do you have a friend or a loved one that is going through any of the above? If you answered “YES” to any of these questions, then Think or Sink will make a huge difference to the quality of your life. Some people consider crawling along in traffic an opportunity to listen to their favorite music or relax and do their best thinking. For others, traffic is a nightmare that will ruin their entire day. For some, a late appointment is a stressful experience, for others, living in a third-world country without running water is a joyful one. Adversity or opportunity? It depends on your perspective. It is not your circumstances that are to blame for the issues in your life. Rather, it is your response to those issues that is the problem. This book shows you how to control your response to life’s issues so that they lead to powerful results. Your response is always a choice. Whether you know it or not, either you make the right choice, or the wrong one is made for you. Many people like to blame their circumstances, especially when times are tough. Blaming the circumstances might make you feel good in the short term but it ultimately leaves you powerless because you have given your power over to your circumstances. This is not a book about what to think. This is a book about how to think for yourself, perhaps for the first time. There are a lot of books that tell you what to do. Sometimes the advice works and sometimes it doesn’t. There is no sure-fire way to tell. This is a different kind of book. This book is about how life works as a process. This book will show you how it works so you can make good decisions about what is right for you. The instinctive response to any crisis or challenge is a predictable and hard-wired physiological reaction. It’s called your fight-or-flight response. The problem isn’t the response itself, the problem is that we tend to overuse this response in situations that don’t really warrant it. This inappropriate stress response has detrimental effects on your health and well-being. This book shows you how to regain control of your responses such that they lead to powerful results in your life. Your response is always a choice. Whether you know it or not, you make a choice or one is made for you. Either way, a choice is made. Successful people and great leaders do one thing differently than most people during times of challenge. They think for themselves and choose powerful states of being instead of sinking into the prevailing negative default state of their circumstances and the people around them.